Changes in the proportion of eyes exhibited best-corrected visual acuity (BCVA) 0.2 (decimal) or better (≥ 0.2), 0.1 or better but worse than 0.2 (≥ 0.1, < 0.2), and worse than 0.1 (< 0.1). 3M = 3 months after diagnosis (1 month after 3 loading injections); 5th Inj. 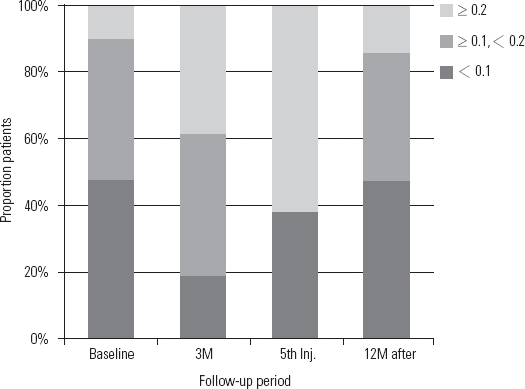 = When the 5th injection was performed; 12M after = 12 months after the 5th injection.